I used to think rules were freeing. Tell me what you want me to do, stand back and let me exceed your expectations. I operated this way for a majority of my life and things were just fine, thank you very much! I realized the constraints of rules when I had to start making the rules. It was a gradual realization, with the older boys, I was still pretty happy with the role of rules in my life. Rules in my classroom were totally necessary. Things began to change when I took some leadership roles. Good gravy, people want to nitpick rules. You have to get more and more specific. I would drive myself crazy trying to think of all possible scenarios and make a rule for each scenario. And still people would nitpick. An excellent example of this middle school girls and dress code. Shorts have to be fingertip length long. Fingertip length is determined by putting your hands down by your side. I've seen girls shrug their shoulders up to their ears to make fingertip length shorter. I've seen girls pull shorts way down on their hips to meet the length. B-man also changed my view of rules. He's so literal. Last week at occupational therapy the secretary had a flower pot on her desk to hold pens. The flower pot had smooth stones in the bottom. B asked if he could have a stone. She said "Yes, if it's ok with your mom." I told him the rock had to stay in his hand. He looked up at me with big eyes "Forever?" "No not forever, just while you're inside this office. You can't throw it." "Can I throw it when I get outside?" "No, not in the parking lot." We proceeded to list all the places you can not throw a rock and where he could throw it. Monday morning I read Galatians 5. 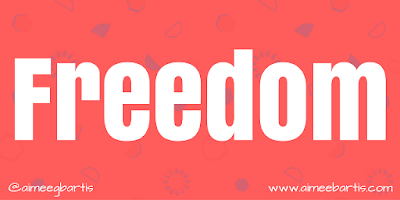 The chapter starts with a familiar verse "For freedom Christ has set us free; stand firm therefore, and do not submit again to a yoke of slavery." 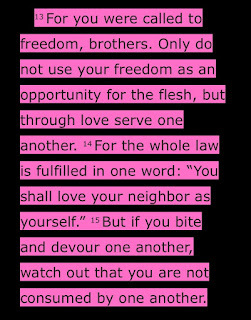 The yoke of slavery Paul is referring to here is the Old Testament law. Some Jewish people who had come to believe in Jesus wanted to cling to the Old Testament law and they wanted to hold the non-Jewish believers, Gentiles, to those same standards. They wanted both Jesus and the law. 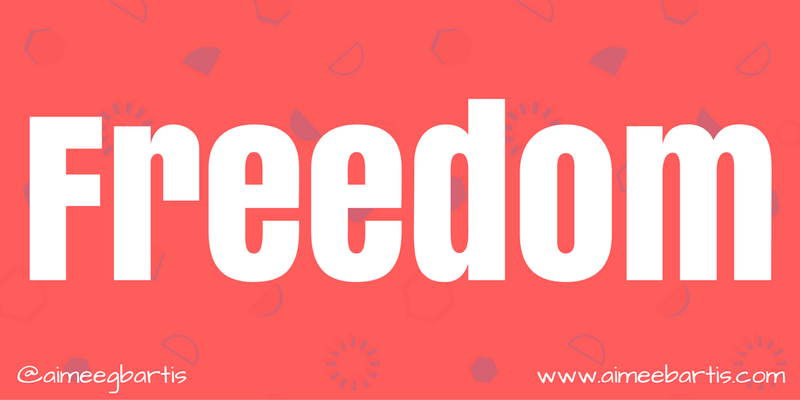 But Jesus had come to complete the law and give us freedom from it. We are saved by grace, we don't have to keep a strict set of rules. As I read on in Galatians 5, verses 13-15 really stood out. 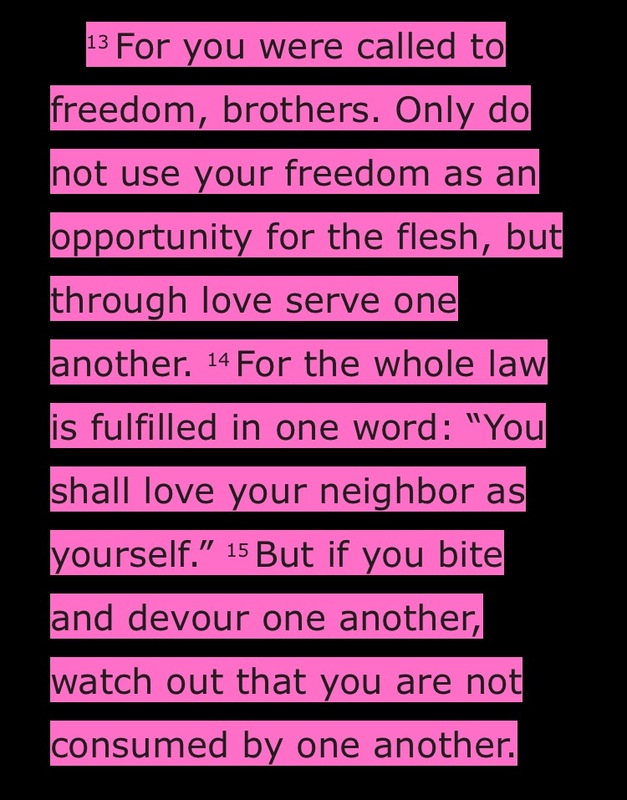 Paul tells us here how to use our freedom. Think back to the first time you took the car out without your parents. What a sense of freedom that was! All I was thinking about what myself. 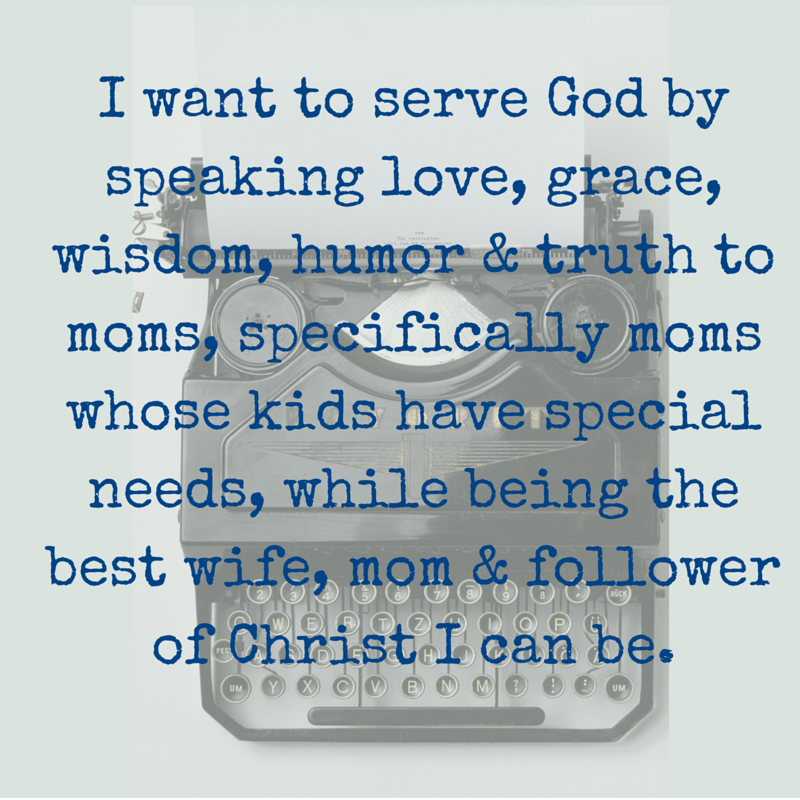 I was NOT thinking about using my freedom to serve others. In verse 14 Paul reiterates the point of Jesus' live, death and resurrection: the law is now fulfilled and we should love our neighbor as ourselves. But it was verse 15 that really stood out to me and drove home the consequences of finding freedom in rules. Rules cause us to nitpick and argue. Paul is warning us here that we will be consumed by this behavior. I'm not down for that! I don't want to be consumed by ugliness. I want to walk in freedom and love. LORD, today, show me how.